I saw some Aircel data card promotion in the street a month or two ago and gave my cell no .Today when I got a sms ( I get 10 scam sms a day) offering Huawei e1751 (7.2mbps/5.6 mbps) @ rs 1399, I thought they are trying to scam Post paid. After a couple of sms's forth and back,called the guy. 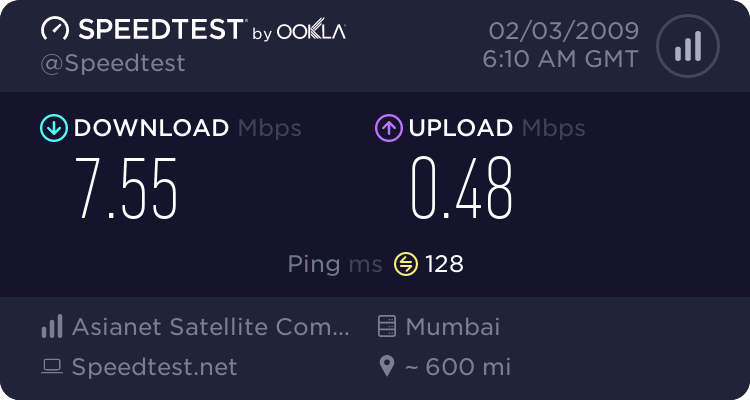 A young fellow working for Aircel distributor answered and I asked him to come home and he did demo in his similar data card+his demo sim(I down loaded couple of you tube videos and checked speed in orbit! ), then signed form (pre paid),activate my new sim and prove that 3 Gb 3G data is indeed there (activated sim and checked first in my Nexus-s android with speed test)+ open sealed new data card + inserted my new sim and checked speed and then finally parted with 140,000 paise!!! 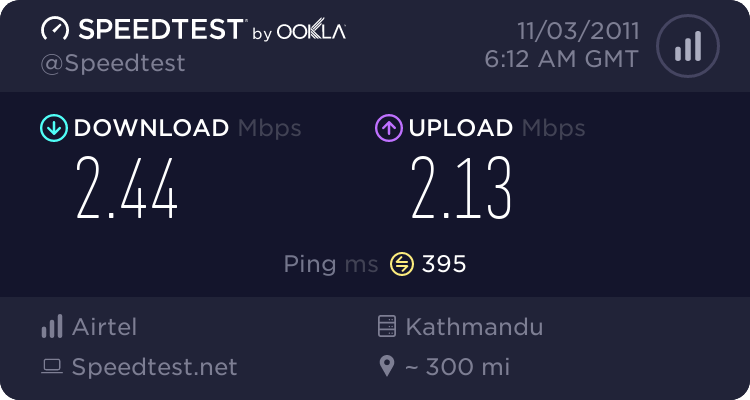 Speed is ok not great .between 1 to 2 Mbps(good speeds only in pro pack). caution: This is a locked card. I will unlock it after 3 Gb free data(worth rs 750!! ) is over. Hyderabad/secunderabad members- if you want to take a risk in this some what good deal, send a PM,I will give the dealer rep phone no. Good offer , 3GB is a bonus......I think huawei modems can be easily unlocked. Sounds like you have taken "paisa vassol" to the next level. Do you mean to say ,You got the new Aircel 3G data sim with free 3GB data valid for 1 month with out buying the Aircel locked 7.2 mbps (huawei E1750c) USB datacard @Rs 1399? I will look in to this !!!! Unlocking Aircel Huawei E1750 was just one click and it connects with in seconds. 3GB -3G free data by Aircel is almost finished . Even though I had down loaded software to create "Unlock code" +flash, went to a site that auto generates unlock code when you type in IMEI and security code (to avoid bots) and got the unlock code+ flash code. Inserted Airtel sim in Aircel 7.2 mbps locked card .Aircel software interface showed full signal but asked for a code.Typed in the unlock code (obtained from the site) and it never asked for Flash.Lock gone permanently!! inserted many sims (appropiate APN has to be entered) and checked in different pc's . Data card connects with out Aircel interface too in Win 7 and thro MDMA too. Able to use Aircel interface for USSD checking other operator sim balance ! So my instinct to go for a 7.2 mbps card @ Rs 1400 delivered to my chair + free Rs 750 (3GB)worth 3 G data payed off. So any of you plan to buy Aircel 7.2 mbps data card ,dont hesitate. It is working better than ZTE (Voda) 3570Z (3.6 mbps) card. 21 mbps UMG 1831 can be got for Rs 2450 approx. Next project Iam in waiting- no hurry- "similar Deal for 21 mbps card "
Can u please tell me the website or mail me the website or mail me the website that auto generates unlock code when you type in IMEI and security code for hauwei modem???? Also not sure 3 GB /30 day free offer available there. Infact 2nd to 4th recharges -you get double data. If Aircel 3G signal at your home is good and you need 3G, you can check local aircel dealers.with 3 GB free data(pre paid) (worth rs 750) ,it is not a bad deal. Dont worry about lock as long it is Huawei 1750.I will help. But miocromax is bit tough . Could you pl give the Site From where we can Get the CODE to UNLOCK Aircel E1750 Pro 3G . Guys, i brought an aircel data card for 1300 with 3G plan of 3GB free for 1 month. Now i want to change the network, since my 3GB data was almost finished. So i referred some of the sites and got the unlock code... whan i kept the Reliance sim in aircel data card it asked for unlock code, and I entererd the code where i got from an website. But still I was unable to use the net thru Reliance sim. I dont know much about APN. So please provide me some information about that. I think modification is necessary in APN. So please tell me what i have to change to make use of net from other sims, using the same aircel data card. give me some suggestions how i can browse through other sims. Since you say the data card unlocked on entering the code, just click "connect" on the internet connection indicator on the bottom tab on the right. If the data card signal is detected , it will ask for APN. just fill in APN and leave everything else blank.It will connect. Could you please tell me how u unluck ur data card ? Bro yu dint understand what i said xactly... MY modem model is E1750c of HUAWEI...when i inserted the any reliance sim, it gets connected. Bit when i using the vodafone sim, it was unable to connect. So i called the vodafone customer care they said yu have to change the APN to get connected thru vodafone. But i dint changed the APN to get connected thru reliance sim. In frank i cant find any option to change APN in my modem there's no option to change the APN. By default it was aircelinternet, and it too even for reliance also. I dint find any option to change APN. So pls anyone help me to get connected thru vodafone. My wish is to i want to connect net thru vodafone. so pls help me if any one can, ecause my 1300 rupees is going to be waste. type in google as "get the unlock code from huawei modem from bloggertrix"
and open the first result yu got from search. what is that flashing of modem? i know about flashing of psp, smartphones etc...but modem? what is that actually?